Does the Gold Coast need a Dive Wreck? The HMAS Darwin is back on the cards and offered to the Gold Coast to be sunk as a diving attraction but do we really need it? Is it worth the the rate payers and tax payers money? The Gold Coast is the number one tourist destination in Australia. It is equally popular by Australians as well as travellers from all over the world. The subtropical climate along with our beautiful beaches makes the Gold Coast the perfect destination to enjoy the sun and the ocean. The scuba diving industry on the Gold Coast is well established, offering a diversified range of tours and courses to suit different needs, preferences and budgets however, scuba diving is not an activity that many tourists specifically visit the Gold Coast for. It is often an activity that travellers discover whilst they are already hear or after they booked their accommodation and are researching the things to do on their holiday. Many locals are not fully aware of the Gold Coast diving options other than the Gold Coast Seaway and Wave Break Island so how shall travellers figure out whether there is anywhere good to dive other than inshore, considering that they rely in the internet and social media as the main source of information. Ian Banks from Diving the Gold Coast had compiled a comprehensive dive site library on his website. Unfortunately the website does not exist anymore which makes us believe that our very own website is now the most comprehensive source of information when it comes to dive sites on the Gold Coast. In saying that, please contact us if we missed someone’s website or blog. The competition in between water based activities is high so the average tourist needs a solid incentive to chose scuba diving over surfing, parasailing, river cruises, paddle boarding, jet skiing, sky diving and the list goes on and on. Well, the answer is simple. We need something exciting, something that sparks interest, something that is seen as a bucket list activity. We believe that a world class diving attraction is the answer! A dive wreck will create an incredibly valuable marine habitat. As the historic wreck of the Scottish Prince proofs, a dive wreck will turn into an amazing artificial reef. A dive site of this scale is almost self-promoting. It will shortly be mentioned in any tourism based publication as one of the top 5 things to do on the Gold Coast. This would make the Gold Coast a diving destination of choice. Non-divers are more encouraged to take scuba lessons and learn to dive in order to dive the wreck once they are certified. The wreck can be sunk close to shore due to the depth lines, minimising boat ride times. The wreck could also be in the middle of our existing reefs and the Scottish Prince shipwreck, creating a variety of diving options, ideal for multi-dive tours or even live-aboard. It will round up the Gold Coast tourism destination profile. Isn’t it exciting to dive down into a ship that has so many stories to tell? Here is a little summary of the HMAS Darwin. 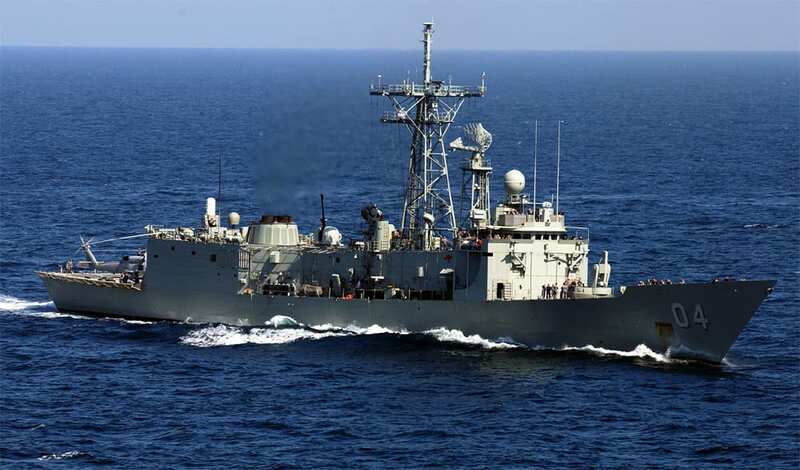 The HMAS Darwin was named after the capital city of the Northern Territory and is an Adelaide-class guided-missile frigate, formerly in service with the Royal Australian Navy (RAN). One of four ships ordered from the United States, the HMAS Darwin entered service in 1984. During her career, she has operated in the Persian Gulf, as part of the INTERFET peacekeeping taskforce, and off the Solomon Islands. The frigate underwent a major upgrade during 2007 and 2008. She was decommissioned on 9 December 2017. Where to sink the wreck? Gold Coast Dive Adventures runs boat dives offshore every week and we have gained valuable knowledge about depth contours and and general diving conditions throughout the year. Depending on environmental approval constrains, we would believe that a spot right next to one of the 25-30m reefs would be ideal depending on the height of the vessel. Entry level divers should be able to explore the upper deck of the vessel where advanced divers submerge themselves to 30m and can even explore the reefs surrounding the wreck. The water along the 30m depth line is often cleaner than closer to shore and there are hardly any currents. But isn’t it a waste of money with no return? A dive site of this scale would attract divers 7 days a week. Multiple operators would run trips, increasing the overall turnover substantially. It is very difficult to estimate the value as there are also indirect affects that are difficult to measure. We would need to consider what every travellers main motivation is, when visiting the Gold Coast. If it is diving, then all associated spendings of this individual from airfares, accommodation, food, other activities are a result of the wreck being there. It also makes the Gold Coast a better package as a whole when people choose the Gold Coast over other holiday destinations. A dive wreck might be one of many items that help making those decisions in favour of he Gold Coast. There seem to be only winners rather than losers. If the government and council do not spend the funds on a dive wreck, it will be spent on something else. The tax and rate payer will not get their money back regardless ;-). Wherever commercial opportunities arise, competition increases. A dive wreck would certainly encourage new businesses to start up and for established businesses to move to the Gold Coast from interstate. This along with a public tendering process to license the limited number of moorings, could likely mean that some of the established local operators may miss out on the opportunity. Something that we don’t like to say at all but it is a realistic scenario to be aware off but there is hope! The easiest way to overcome this challenge is for local operators to join forces and work together as one team. This could be in the form of partnerships such as mooring sharing schemes etc. At Gold Coast Dive Adventures we believe that exploring our ocean is a privilege that we must never take for granted. We are excited by the opportunity the HMAS Darwin presents to our home, the Gold Coast and we are looking forward to continue to share an amazing diving playground with divers from all over the world. HMAS Darwin, the Gold Coast is ready for you! !